A breezy morning in late March found me sauntering alone along the Tidal Basin in Washington, DC searching for the perfect composition. With the Cherry Blossoms blooming, I was out early in the hope of catching this marvelous scene. 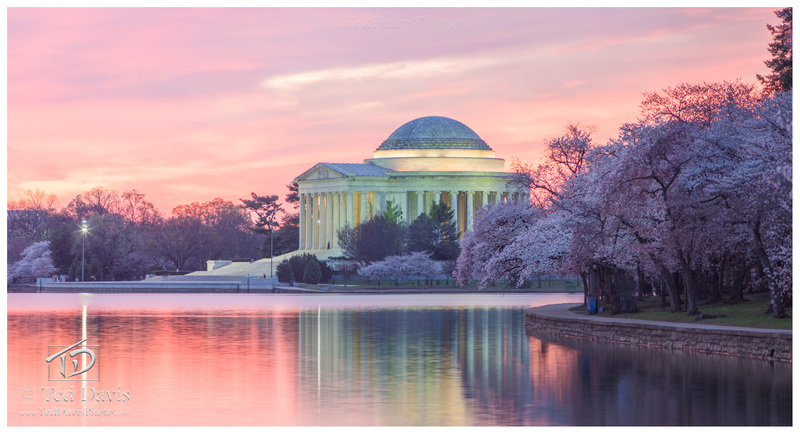 As the minutes ticked by I realized I was going to be treated to an absolutely breath-taking sunrise rising above the Jefferson Memorial to complement the pink and whites pastels of the Cherry Blossoms. As the Tidal Basin began to come alive with activity, I snapped the shot minutes before the scene became populated with people taking in the beauty I captured. . Photo © copyright by Ted Davis.